The wild fire just East of us continues to grow. But we are blessed with a lot of help to keep us safe. 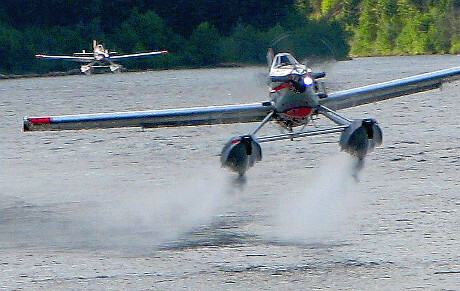 These pictures from Monday are of water bombers taking up water from Otter Lake. There are wildfires all over BC, thousands of people are displaced, and the province is in a state of emergency. The closest to us is 10 Km NE of Princeton. We are in the Kamloops Fire Centre area and if you want to know more, the active fires are listed on this web page. Currently there are 146 firefighters, 8 helicopters, and 17 heavy equipment on the job. Check the Fire Centre for updates on this fire. Emergency Info BC has current information on evacuation alerts. The 1885 Gold Rush in the Similkameen Valley centred on the tiny creek near present day Coalmont that was named Granite. A settlement grew at the site and miners arrived from as far away as California looking for new rivers and creeks to mine. Within two decades after being partially rebuilt following a fire in 1907, the community was largely abandoned and has been known as a ghost town since the 1930’s. The Granite Creek Preservation Society was formed in 2013. The group’s mandate is hefty considering the historic significance of the once thriving gold town. The GCPS desires to protect the territorial integrity of the town site. Through their efforts they have worked to provide an understanding of the importance of the historical, archaeological and geological aspects of the ghost town and surrounding land. The group has taken on this task in order to encourage continued study of the significance of the historic gold mining town. It took the GCPS 18 months of hard work to reach a major step in their preservation efforts. That was when they were granted a License of Occupation with the approval of the RDOS. The LoO is a requirement before any kind of physical preservation can take place at the town site. The GCPS has had a self-guided interpretive walking tour on their radar for years. The LoO allows them to proceed with a plan, with the assistance of the RDOS, to place a total of ten story boards/interpretive signs at Granite. Two will be in the area of the Granite Creek Cemetery with the remaining eight to appear within the footprint of the ghost town site. Each sign will feature photos of landmarks or buildings as they once appeared and a documentation of what may have happened at the location during the height of Granite Creek’s popularity. Signs will recount significant activities, identify key community leaders and important buildings adding to the experience of walking the streets of what was once one of the largest settlements in British Columbia. Grant applications are currently in process to assist with funding this exciting development of bringing life to Granite. Prompted by contact by Consumer Protection BC, the GCPS is in the process of becoming the Operator of the Granite Creek Cemetery, which was closed in 2007. Although the group had been unofficially taking care of the cosmetic appearance of the Cemetery as well as researching and documenting burial records for the site, they recently opted to apply to become the official Cemetery Operator. The process is complicated as it involves several steps, the first being obtaining a Lease for the property where the Granite Creek Cemetery sits. The goal of the Society is to reopen the Cemetery to allow for full body burials, cremated remain interments and the scattering of cremains for residents (and the families of residents) of Coalmont, Granite Creek and Blakeburn. 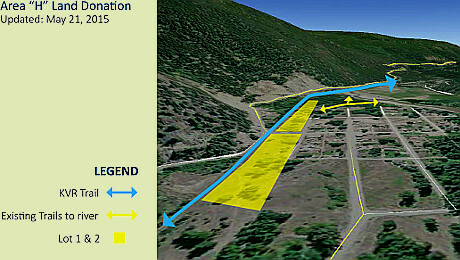 The group is early in the stages to reopen the Cemetery and is hopeful they will achieve this goal within 2017.
Letters of Support for the GCPS becoming the official Operator of the Granite Creek Cemetery can be filed online at this link or comments can be mailed to the Senior Land Officer, Thompson-Okanagan, MFLNRO, at 441 Columbia Street in Kamloops, BC V2C 2T3. You can also support the Granite Creek Preservation Society by becoming a Member. Membership is $10 per year and you can join online at www.granitecreekbc.ca. Or if you prefer, you can just make a donation to support the efforts of the GCPS in preserving the ghost town and Cemetery. Please visit the Granite Creek Preservation Society web site. 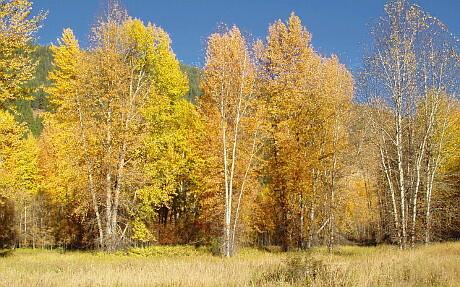 One of the defining characteristics of Coalmont is the cottonwoods. These floodplain pioneers have laid the foundation of our local ecosystem but have mostly been pushed away by the invasion of people. This is the case everywhere in this corner of the continent where these interesting trees live. Cottonwood riparian forests are a biological treasure. They house an amazing variety of plants and animals. Unfortunately, these ecosystems are at risk in British Columbia. The problem is that they are located on level and fertile land, which is exactly where people like to settle. Human activities have destroyed many old cottonwood forests and only fragments remain. It is estimated that we have lost 85 percent of valley bottom riparian habitat and much of what is left is in poor health. In semi-arid areas like the South Okanagan and Lower Similkameen, riparian areas are important for maintaining plant and animal diversity for the whole region. Studies have shown that 80 percent of wildlife are either directly dependent on riparian ecosystems or use them more frequently than other habitats. Extensive, healthy riparian systems are critical for wildlife, and habitat restoration and protection are high priorities for wildlife management. Since wetland and riparian areas cover only 4 percent of the region yet are critical for so many species, the loss of small areas can have a dramatic effect on local wildlife populations. Here in Coalmont we have cut down many of the large old trees because they are unsafe to have near our houses. This is unfortunate, but cannot be avoided. However, we are lucky that there are still some intact areas nearby which can serve their important environmental purpose if we take care of them. The Princeton Museum and Archives houses some of our most dear historical artifacts from this area. Individuals and families have donated their heirlooms and fonds so that they will survive into the future and be available for generations to come. This, along with education and interpretation, is the job with which a museum society is tasked and which is the core of their constitution. Museums can often raise money and provide a focus for tourism, but that is only relevant in as much as it benefits their main goals, and not as ends in themselves. The Princeton and District Museum and Archives Society has been in existence and run by volunteers since the 1950s. Currently there is a part time manager who makes the whole thing run smoothly. These last few weeks a plan by the Town of Princeton to take over the museum has come to light. Exactly what they believe to be “the museum” is not clear yet, but it looks like they are asking the Museum Society to dissolve and give the collections to them. This is putting the artifacts at risk because the town has no mandate such as a museum society does. Presumably some new legal document would be written up, but obviously that could not be sanctioned or approved by the people who had made donations in the past. These people made a deal with the museum society and not with the Town of Princeton. At this point it is not known what the outcome will be. We do know that the building is owned by the town. We also know that the museum society is an official repository of First Nations artifacts in the valley. The First Nations view of a possible transfer is not known. In any case, this is going to be an interesting situation which will no doubt bring out some heated discussion between those who support the traditional role of one of our oldest cultural institutions in the area, and those who wish to see a more radical political and business approach as the way forward. If you are interested in participating in these discussions and becoming a member of the Museum, please come to the Annual General Meeting Thursday 17 March, 7 pm at the Museum on Vermilion. At five minutes after one in the afternoon Coalmont went dark. It wasn’t until 7 p.m. that the lights came back on. Interestingly, when someone called to report the outage, Fortis wasn’t aware that there was a problem. Apparently they don’t do any monitoring of the grid or meters. Not only that, but one Coalmontian reports that “About half an hour after the power went on, a lady from Fortis called us to see if the power was back on in Coalmont“. So apparently those expensive smart meters also don’t report when the power is on. As we all know, our Telus payphone eventually did get installed, thanks to the hard work of Bob and Diane Sterne who were simply not going to give up. Unfortunately, after all that we still got somebody with an emergency need wandering around town because they couldn’t find the payphone. No wonder. Telus had provided us with a sign, but it was only visible if you had a view up and down Front Street. So, the Sterns put further pressure on Telus and it payed off. Today, there was a package from Telus with an additional sign and Bob put it up right away. Hopefully now someone traveling on Parrish (at Coalmont Road), or even along the KVR trail, will be able to see it. Thanks to Bob and Diane Sterne, as well as David Fowler from Telus, for getting this happening for us. There was a rock slide on the Coalmont Road earlier this evening and passage is now closed in both directions. According to one motorist who wasn’t able to make it to Princeton the slide happened around a quarter after five. The location of the slide is a few feet east of the yield sign by the defile. Although it appears that the road itself has not given way, the debris is apparently too big to clear this evening and in the interest of safety needs to be carefully looked at during daylight. Argo has been out there all evening. The Drive BC Road Conditions site reports that the next update will be tomorrow, Friday, November 19, 2015 at 10:00 am. At this point there is no knowing when the highway will be open again, but people planning to go to work in Princeton should at least make other plans for the morning. Although it would add almost an hour each way, an alternate route would be Highway 5A and Otter Valley Rd. UPDATE: There is an Argo truck at the gate by Parrish and Coalmont Road to warn people not to go that way unless they’re local. They now say that it might be cleared today but more likely by tomorrow. Drive BC says they will have the next update tomorrow (Friday) at noon. UPDATE 2: As of late Thursday afternoon the road is open again. However, they were still working on it so expect delays. The last meeting of the Regional District had an important agenda item. 1. Area H Parkland Donation: To accept the offer of parkland donation. It was MOVED and SECONDED THAT the Board of Directors accept the offer of parkland dedication in Coalmont, pending the results of the proposed environmental audit. Argo has been ditching the Coalmont Road and when they do that there’s free fill to be had. Today they continued using it to widen the stretch of the KVR between Parrish and the Betts shortcut. As seen in the pictures below, the first half of the block has been done previously, and now they’re continuing on the second half. Area ‘H’ representative Bob Coyne was not aware of any plan involving this work, and the Regional District Parks and Facilities Coordinator, Justin Shuttleworth, was not available for comment. If anybody has any knowledge of what the plan is, and who is behind it, please say so in the comments below. UPDATE: Several people with an interest in the KVR have called to say that this is the area where there was a sidetrack on the old railway and because of the width, this would be a good place for a staging area for trail users, and perhaps also a helicopter landing. FortisBC will soon be installing advanced meters in Coalmont. We have confirmed that there is indeed a work order for our town, and they will be doing the work between June 22 and June 26. Meter exchanges will take place Monday to Friday between 8 a.m. and 6 p.m. Just like when your meter is normally read, you do not need to be at home. Despite motions opposing the installation of smart meters in many municipalities, the provincial government has insisted that installations would proceed. FortisBC started installing the new meters in late 2014, are doing the Similkameen area now, and will finish with the Kootenays in late 2015. Although the basic technology is considered by some experts to have been outdated long before it was even proposed, Fortis still believes that their implementation carries many advantages. It is not clear just how many of those are of benefit to the end user but they place more billing options, fewer estimates, and online tools, at the top of their list. For a more complete sales pitch on Advanced Meter Infrastructure (AMI) visit Fortisbc.com/ami. Current privacy concerns appear minimal, but future advanced options offer significant intrusion. At this time three years of data will be available for immediate retrieval and four additional years will be archived. Friday evening’s informational meeting in Tulameen regarding trails was very well attended. In fact one person in the audience pointed out that he hadn’t seen such a turnout for a while and that this was surely testimony to the fact that here is an issue which many people care about. However, the issue which many in the audience had expected to confront, was apparently not the thrust of what the presenters had intended. Planned speakers were the Regional District Parks and Facilities Coordinator Justin Shuttleworth, president of the China Ride Trails and historical trail researcher Kelly Cook, and Bob Coyne who is our Regional Representative, but for this occasion was here on behalf of China Ridge Trails Society. On hand also was Ken Reeve from the Vermilion Trails Society. The meeting was sponsored by the Tulameen Community Club who had sent out notice with the following call. ATTENTION! Mountain bikers, hikers, walkers, quadders, dirt bikers, snowmobilers. 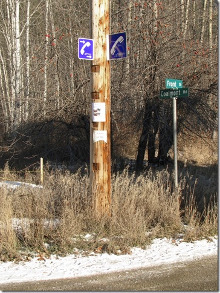 ALL users of the Trans Canada Trail and all other trails in our area…. now is the time to find out what/where/when/how you can and will be able to use the trails now and in the future. Perhaps that is what set the audience’s expectation. It certainly became clear soon after the meeting started that a fair section of the audience, and certainly the notable number of Coalmontians present, were there to air their displeasure with how they felt about their access to the trails in general – mostly regarding the new Provincial off-road motorized vehicle regulations as this has fired up many people. Justin Shuttleworth is the Parks and Facilities Coordinator for the Regional District. He claims to have no agenda regarding the KVR trail but says he has put a lot of time into this. He is concerned with trail maintenance and explains that it is currently being done through Vermilion Trails Society. His stance on usage is that it is, and should be, “respect based”. It is interesting to note that there are 5 active Trans Canada Trail groups in the RDOS. Currently the district jurisdiction stops 11 km short of Brookmere, but they’re trying to get that section included. The most interesting part of his presentation was regarding the recent slide by the second trestle on the KVR. Shuttleworth says that the geotech report just came in today and they will be looking at that to determine the way forward. He feels confident that money will be found to clear up the slide but it could take a little while. The best case scenario would see the job finished by the end of summer. Bob Coyne’s presentation about the China Creek trails was short but informative. He points out that the reason that they request non-motorized only use is that it causes a lot of damage to the snow grooming equipment and actually costs them time and money, neither of which they have a lot of. Here, Kelly Cook interjects that it would really be better to avoid the negative expression “non-motorized” and instead talk about “self propelled”. They have single track bike trails and 40 km of trail which they maintain in the winter time. Coyne also says that the China Creek trails are all designed for family use. There was some argumentative resistance from the floor regarding the China Creek policies, but in the end it looked like people understood that there is access for everybody to that area and that it is imperative that certain trails be designated for specific uses or it won’t work. Kelly Cook presented on her research and work with the Hudson Bay Heritage Trail. This is the fur trail, and not to be confused with the Dewdney Trail. In fact it has roots going back much further in history. But perhaps the most significant local role, indeed in Canadian history, is that this trail as used by the Hudson’s Bay formed the basis of Canada establishing sovereignty in this area. The trailhead is at the Tulameen museum and it goes all the way to the Coquihalla. It is unfortunate that there is no parking in Tulameen for those who want to start a hike there, but perhaps that can be remedied in the future. More work will be done to manage trail usage and we can expect to hear a lot about this exciting project in the future. There was not anything to fault or argue with in Kelly Cook’s presentation, but throughout the rest of the meeting one could sense that much of the audience was there to get answers about motorized trail usage – specifically on the KVR. With the Victoria Day weekend coming up, we’re seeing a steady stream of vehicles along the Coalmont road. What most people don’t notice is that none of them are honking their horn. Why is that? Some readers may suggest that of course they’re not honking, that would be pretty offensive if they did. Well we’ve go news for you! According to the BC Motor Vehicle Act Regulations, it’s an offense not to. In fact, for a driver charged with this contravention there is currently a $109 fine and 2 points on your license. 196 When travelling through defiles or canyons or on mountain highways, the driver of a motor vehicle must hold the motor vehicle under control and as near the right hand edge of the highway as reasonably possible, and on approaching a curve where the view is obstructed within a distance of 60 m along the highway, must give audible warning with the horn of the motor vehicle. One can argue about the steepness of the mountain sides and whether the Coalmont road goes through a “canyon” or if it’s just a valley, but there is no doubt that it’s a mountain highway. Neither is there any doubt that the slide area is a “defile” since a single lane is the very definition thereof. So, how many places do you count along the road where your vision is obstructed 60 meters (200 feet) along? This is a bit of a conundrum. If you don’t honk, you’re committing an offense. If you do honk, you’re being offensive. 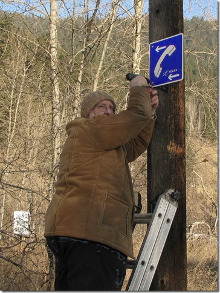 Telus has informed us that they do not intend to replace the pay telephone here in Coalmont. The location of the, now gone, payphone was just at the entrance to town and the first thing you see when either coming here by road or traveling through on the trail. It was well known to recreational off-road vehicle enthusiasts who relied on it being there should they need to call 911 while in the area. This is not good news for this community, nor for the Trans Canada Trail users. This public telephone was the only way of getting emergency help in the area. There is no cell service. Telus has a different view. “There is a payphone available at the Coalmont Hotel” Verdi said. Indeed, old timers here know about that phone. They may also know where to contact the proprietors to come and let them in when the saloon is not open. Visitors to the area, such as Trans Canada Trail users, would never find that phone, and these are the people most at risk. With no cell service many feel that something needs to be done to provide emergency contact for those who don’t have a house with a traditional landline. On any given weekend, that could be half the population of the area because we have a very high level of tourism in these parts. 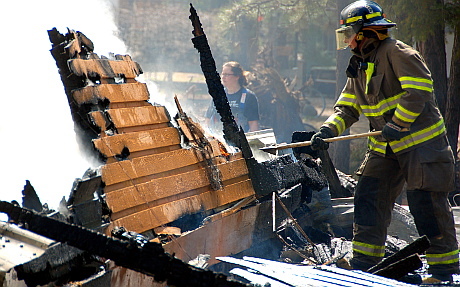 A house fire in Tulameen shortly after 10:00 am Tuesday, April 21 has destroyed two homes in Tulameen. Fire fighters from both Tulameen and Princeton attended, as well as an ambulance to stand by in case of injury. Both homes were completely destroyed. Neighbouring homes were counting their blessings that the fire did not spread further. Opinion: Some recent events in Coalmont have ended up in court and elicited considerable interest further afield. The Similkameen Spotlight painted a colourful picture with the headline Coalmont ‘spiraling out of control’. That quote is from a Provincial Judge, and to many here it comes across as a slur. It might be relevant had it been limited to this court case – a story about escalating ructions centering around a specific situation. True, a number of nearby residents have been unpleasantly effected, but this is far from being a community wide issue. That the court documents purportedly listed at least one person central to the case as being Coalmontian, when in fact they were visiting from the lower mainland, does not help to clarify the picture. Coalmont is certainly not out of control. This is a diverse community, and there are indeed some real characters, but there is also a measure of empathy and social understanding. Yes, there are strong feelings and opinions, but people are really much more tolerant than they sometimes sound. In fact the issues which lead to a Judge’s apparent generalization only serve to underline just how much outsiders don’t know us. Despite our differences, there is still concern and real help being offered to those who have gotten themselves into a difficult place. The reality is that our humanity will prevail. Although I do appreciate the drama and intrigue, I’m not sure that many readers from out of town, specifically Princeton, have the perspective to understand that they are hearing an enhanced colouration of our famous local mythology. The view from here is really quite different. And that is a good thing. Registration of your quad will become mandatory on June 1, 2015. That’s just over 6 weeks from now. The combined cost of the number plate and registration fee is $48. Cross a highway without having to obtain an operation permit if the crossing is controlled by a stop sign or traffic light. Cross a highway where local police authorize through an operation permit. Load or unload in a parking lot without an operation permit. Obtain an operation permit with an extended term of up to two years.